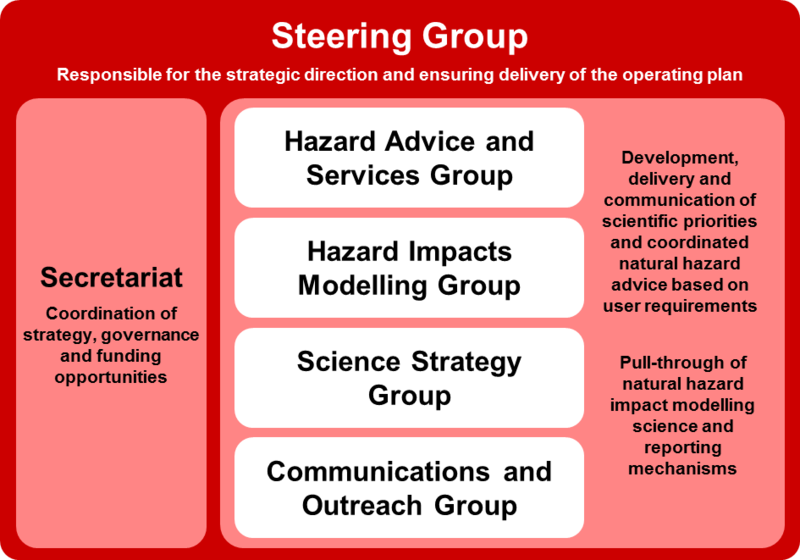 The Natural Hazards Partnership is made up of four sub-groups with overarching steer and governance from the Steering Group and Secretariat. You can see our NHP Operating Plan (2018 - 2020), which outlines our goals and details how we plan to achieve them. Our governance structure including the aims of each group is outlined below. The Natural Hazards Partnership Secretariat is made up of the Chair of the Steering Group and the Governance and Funding Coordinator. Along with many other duties, the secretariat manages our governance and funding, and supports the Steering Group and sub-groups in delivering coordinated assessments, research and advice on natural hazards to UK government and wider audiences. Scientific collaboration, research and knowledge exchange. Policy advice to government and emergency responders. User needs, communications and outreach. Review and ongoing development of the Daily Hazard Assessment (DHA) product in response to user needs. Development of new multi-hazard outlook prototype products based on consolidation of existing ‘patchwork’ of services. Development and update of multi-natural hazard case studies and Science Notes through the HASG Science Review sub-group (SRG). Coordinated scientific advice to the Cabinet Office led National Risk Assessment (NRA) process including consideration of new and ‘linked and compound’ risks. Review and ongoing development of multi-hazard matrices to ensure consistency of risk assessment and presentation. Development of business rules and capabilities for utilising social media sourced hazard impact reports based on existing and emerging initiatives. Development of options, based on user needs, for improved and better coordinated advice and service delivery mechanisms in support of multi-hazard preparation and response operations. Development of Hazard Impact Framework (HIF) standards to support the development of the Hazard Impact Production System (HIPS), an integrated, community of open platforms whose collective outputs are delivered to partners. Coordinated research projects to develop Hazard Impact Models (HIMs), capable of the consistent quantification of impacts from a range of natural hazards to allow better understanding of the impact risks of hazard events. Improved access to spatially and temporally explicit environmental data. Improved access to impact information from the public, media and records maintained by emergency services and critical infrastructure providers to enable case study analysis and forecast verification. Definition of research priorities for hazard management. Development and implementation of our 3-year research plan. Development of a portfolio of our research projects. Regular reviews with relevant sub-groups, target audiences and product/service delivery mechanisms. Delivery of outcomes focused on 'Natural Hazards Partnership Science and Services' stakeholder consultation workshops, with recommendations reported to the Steering Group. Development of ‘best practice’ promotional material for Government departments and other stakeholders at home and abroad.